Over the past 3 years or so I have spent quite a lot of time testing, studying and analyzing Google’s search engine “algorithm”. Everything from data center analysis, to IP relative local results reporting and more….some days you sit back and realize that Google SERP’s (search engine results pages) control a large portion of the success of your business, and other days you tear your hair out when the algorithm seems to display wacky results on the SERP’s for no apparent reason. 1. It seems much, much faster to query out your search and generate the search results page. I’m talking IE7 to Firefox speed difference in browser terms! In my opinion, the current speed of the Google search engine is quite amazing to be able to process it as quickly as it does, and the new version seems to be even faster. 2. Local Business Map Results have been cleaned up – this is an area of Google SERP’s that needs a lot of work, and has done for a long time. It is too easy for spam listings to get on here, many duplicated listings, inaccurate information matching of listing data to website information, and many more small bugs. The new version seems to have made some improvements on this, especially visually. You can see in the current screen shot that the abc list is a little messy with the “title” spanning almost the entire width of the display area, pushing the rest of the listing information down to a second line. Now, have a look at the new version. Much more clean, with the “title” being snipped after a certain amount of characters. This helps to give more space to the other normal results below and is much easier on the eye. Another change that seems to be apparent in the new Google Search Engine, is the fact that they no longer display the second tier results. These are the results that display under a main result, and are shown if they hold a close relevancy to the search query along with the main result above it. 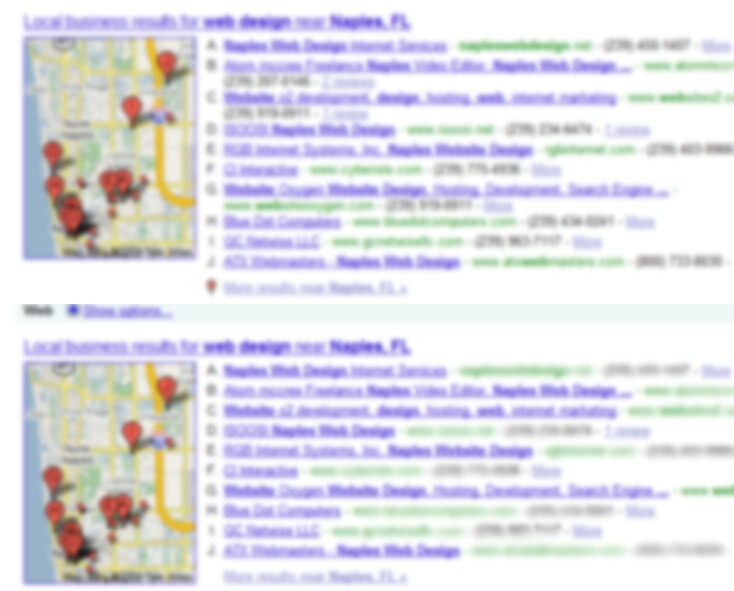 For a search on “Fort Myers web design“, the current results page gives you a two-tiered result at the number one spot just below the map results. In the new Google version, it does not show this second tier result. It must be noted that even in the current Google SERP’s, it seems that sometimes the second tier results show up for some results and sometimes they don’t. This is another issue that seems a little buggy with Google’s algorithm.